Read Russia prize also recognizes translators from Italy, Mexico and Spain. On Sept. 10, the Pashkov House, one of the most beautiful buildings in Moscow and the oldest building of the Russian State Library, played host to the awards ceremony of the Read Russia Prize. The evening was chaired by the Russian president’s Special Representative for International Cultural Cooperation, Mikhail Shvydkoi. 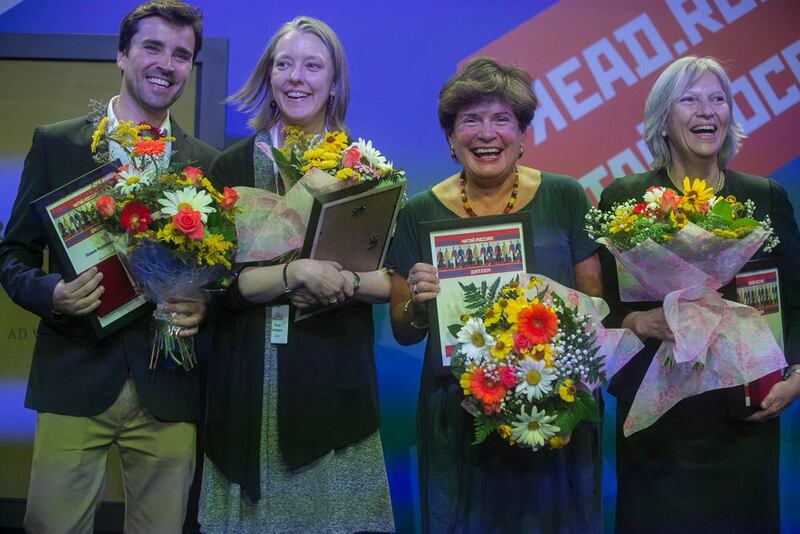 The Read Russia Prize is awarded once every two years to a translator or a group of translators and a publishing house for the best translation of Russian literature published within the last two years. In addition to a diploma and medallion, winners also receive a cash prize. The 2014-2016 season was the third season for the award, and the jury received 156 applications from 28 countries for the prize. This year’s award ceremony was the central event of the IV International Congress of Translators of Fine Literature, which took place at the Russian State Library on Sept. 8-11. Spanish translator Joaquín Fernández-Valdés and the Alba publishing house from Barcelona received the prize in the category "Classic literature of the 19th century" for Fernández-Valdés’s translation of Ivan Turgenev's Fathers and Sons. Fernández-Valdés received his award from the hands of Natalia Solzhenitsyna, the widow of the famous Soviet writer and historian Alexander Solzhenitsyn. Solzhenitsyna is also the president of the Solzhenitsyn Aid Fund and a member of the board of trustees for the Read Russia prize. In the speech she gave presenting the award, Solzhenitsyna noted that that the processes of globalization and technical advancement are inevitably simplifying language. "This tendency is being strengthened by the fact that countries tend to unite, and unions tend to monopolize and simplify communication tools," Solzhenitsyna said, pointing out that in such a situation, it's very important that national cultures rumored to be in decline don't give up, but "peer anew in their roots and try to estimate themselves anew.” She noted that translators exist so that national cultures can be understood by their neighbors, and that the it was very important that the prize go to a translator into Spanish, the world’s second-most spoken language. Fernández-Valdés has already translated Turgenev's novels The Noble Nest and On the Eve; he was also awarded with a special diploma for his translation of Leo Tolstoy The kingdom of god is within you. Another Spanish-speaking translator, Selma Ancira and the Fondo de Cultura Económica publishing house from Mexico won the prize in the "Literature of the 20th century (pre-1990)" category for her translation of selected stories by 20th-century Russian writers, Fancy landscape of Russian literature. Vadim Duda, the director of the All-Russian State Library for Foreign Literature, presented the award to Ancira. In his speech, Duda noted the exciting atmosphere surrounding the event, and announced a plan to create a special center for Spanish language and culture in his library. Lisa Hayden, an American translator based in Maine, and Oneworld Publications from London were recognized as the best in the category "Contemporary literature (post-1990)" for her translation of Laurus, a novel by Eugene Vodolazkin. She received her award from Konstantin Kosachev, the former head of Rossotrudnichestvo who now serves as chairman of the Committee of Foreign Affairs of the Federation Council, the upper house of Russia’s parliament. Commenting on the award, novelist Vodolazkin said: "I feel a great joy and pride for Lisa, because she committed the impossible thing — she translated the novel that seemed to be non-translatable for me. She faced a problem with the ancient Russian words, but she managed with them perfectly. Her main feature was that she followed the text of the novel, very carefully listened to its pulse and followed its pace, that's why the translation appeared to be as if the novel was written direct in English." In addition to her work as a translator, Hayden serves as a jury member of Russia's Big Book literary prize, and she writes about Russian literature in her blog, Lizok's Bookshelf. Marian Schwartz, who won the Read Russia prize last season for her translation of Tolstoy's Anna Karenina, told RBTH that Hayden could not have been a better choice. "This is amazing translator and the project is perfect," Schwartz said. "It’s going to be good for Russian literature to have a book that such a wide range of people can enjoy." Schwartz also noted that she is very pleased about Claudia Scandura’s award. The Italian translator and Gattomerlino publishing house received an award in the Poetry category for her translation of Sergei Gandlevsky's Rust and Yellow. Scandura’s award was presented by Alexander Zhuravsky, the deputy minister of culture. Scandura is head of the Slavic department at Roma University Sapienza. Among her translations are works of Anton Chekhov and Timur Kibirov.